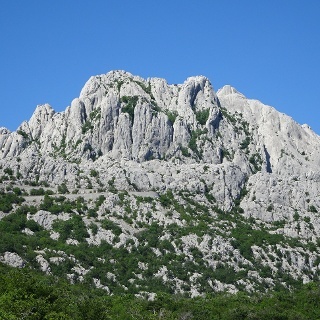 Crnopac is the southernmost section of Velebit, and also one of the mountain's most attractive parts. 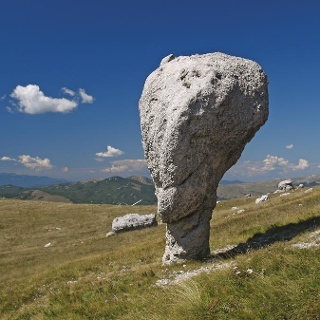 This terrain has very pronounced karst characteristics, and it is full of pits, deep dolines and steep cliffs – a true labyrinth of white rocky limestone peaks. This entire karst area is slightly separated from southern Velebit, thus providing wide views. The main ridge is predominantly covered in grass, spreading from northwest to southeast, marked by rocky peaks with strong karst characteristics. On the southern side of Crnopac, steep slopes tower above the canyon of Zrmanja. There are many caves and pits in the area of Crnopac. In the peak area, many pits can be seen right next to marked trails, and one can even descend to some pits along marked access paths. On the northern slopes, we come across Cerovačke Caves and the longest cave system in the area of the Dinarides: Kita Gaćešina - Draženova puhaljka cave system. Wonderful Crnopac, area as well as hut. This is a must see and I believe still a hidden treasure of Velebit. Put Malog Princa is amazing, so many holes, various rock shapes,... We stayed there 2 nights so we could also explore Crnopac peak - this trail is bit more challenging and we returned back to the hut. Just be careful with water there, they have only rain water and there is not much rain... There are 2 water reservoirs and we panicked when the first one was empty and we had no idea about the second one. It is behind the hut. Beautiful views, well marked and water at Skloniste Crnopac, super sweet hut!